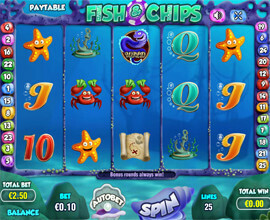 Fish & Chips video slot game offers exciting and fun underwater adventures. There are plenty of chances to win as well as an incredible 100,000 jackpot. Dive into a sea of smooth graphics and easy game play with Fish & Chips, plus the Sea Snake wild symbol can substitute for almost all symbols and gives you up to 10X the payout. Select the amount of money that you would like to bet per line by clicking on “Bet” amount, you can rotate through the different available values by clicking on the amount again. Then, choose the number of lines that you would like to play with, select from 1 to 25 lines. Remember that the amount you bet is multiplied by the number of lines selected. The more lines you play, the great your chances of winning and the more you can win. Now, click the “Spin” button. 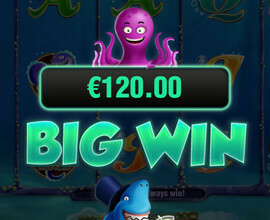 All of your winnings will be automatically added to your “Total Win”, after each spin. You can view your winnings on the bottom right of the screen. 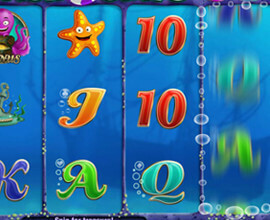 3 or more Shark scatter symbols anywhere on the reels pay a multiple of your bet. Three scatters anywhere pays 5X your bet, four scatters pays 35X your bet and 5 scatter symbols pays 100X your bet. The Eel symbol is wild and can substitute for any symbol except a scatter or bonus symbol. 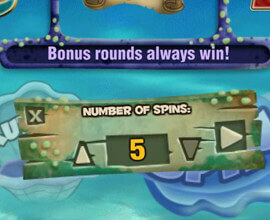 Land 3 or more Squid bonus symbols to trigger the bonus round for guaranteed wins. All bonus wins are multiplied by your line bet amount. The ‘Auto Bet’ feature of the game allows you to place a number of predetermined spins. The paytable located on the top left shows all the winning symbols and amounts.